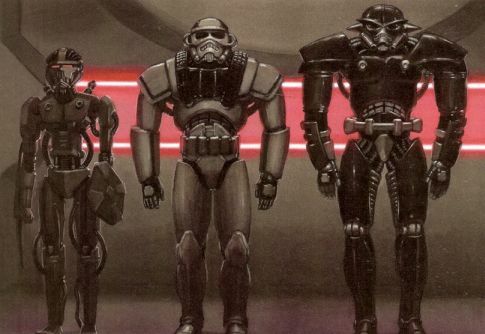 The Phase III Darktrooper is not truly a droid like the first two types. It is actually a powered suit of armor which can be used as one would any other powersuit, albeit one with a much more powerful arsenal. -Basic Suit: +3D+1 physical, +2D+2 energy to resist damage. -Jet Pack: Adds 8 to move (already shown) when activated. Lasts for 4 hours, then must be recharged. -Proximity Detector: Detects any life form (or one previously specified) when it enters a 75 meter radius. -Self Destruct Mechanism: To prevent suit from falling into enemy hands, if trooper inside the suit dies, then suit destroys itself after 1D rounds. Causes 5D/4D/3D damage. Requires a Heroic+10 security roll to disable. -Self Contained Atmosphere: Trooper inside suit can survive in hostile environments for 6 hours, and vacuum for 2. -Jet Pack: Doubles movement rate for any round in which it is used, and allows the user to travel in 3 dimensions. Lasts for 4 hours before recharge. -Proximity Detector: By making a Computer Use roll (DC 15), anyone operating the powersuit may detect any life forms within a 75 meter radius. -Self-Destruct Mechanism: To prevent suit from falling into enemy hands, if trooper inside the suit dies, then suit destroys itself after 1d6 rounds. The explosion is as per a thermal detonator (see Core Rulebook, p. 116), and only a Computer Use roll (DC 30) from inside the suit can disable the device. -Atmospheric Control System: Character operating the powersuit can survive in hostile environments for up to 6 hours, and in a complete vacuum for up to 2 hours.